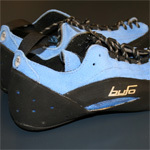 Technical climbing shoes are required for bouldering and top rope or lead climbing. 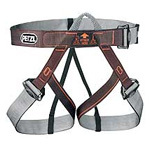 Approved climbing harnesses are required for top rope and lead climbing. Climbing harnesses and shoes are available for rent at the ARC Adventure Center. Rental gear is only for indoor use at the ARC climbing wall. See the following for gear available for rent. 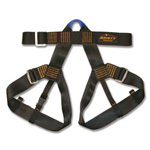 Rental Fee: $1 Highly adjustable program harness designed specifically for climbing gyms but also entirely suitable for ropes and challenge courses. 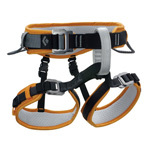 Double pass waist buckle and quick adjust leg loops provide a secure fit. Rental Fee: $1 Designed to be a kid’s version of our new Momentum Speed harness, the new Wiz Kid features one Speed Buckle for quick and safe adjustment. The modern styling allows a child to climb alongside an idol and still look cool. Recommended for top-roping only. One size fits kids from 35-110 pounds (16-50 kg). Rental Fee: $1 (free if renting harness) A versatile, lightweight belay/rappel device. Rope slots are engineered to increase friction on the rope. Single or double rope compatible (8 mm to 11 mm ropes). Cooling fins to dissipate heat more efficiently. Hard anodized for longer wear. CNC machined from 6061 T-6 aluminum. 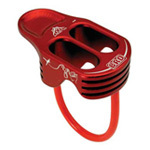 Comes with a Locking Carabiner. Price: $3.95 (single roll) 100% cotton athletic tape 1½” wide x 33′ long (3.8 cm x 10 m) Retail packaging includes illustrated, step-by-step taping instructions. 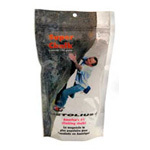 Price: $2 (2.5 oz – 70 g) Price: $4 (5 oz – 141 g) The #1 selling brand of climbing chalk in America! The original chalk specifically formulated for rock climbing. A safe drying agent is added to the highest-quality magnesium carbonate for maximum sweat absorption and friction. 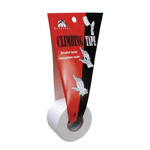 Price: $4.25 The #1 selling brand of climbing chalk in America! The original chalk specifically formulated for rock climbing. A safe drying agent is added to the highest-quality magnesium carbonate for maximum sweat absorption and friction. Reduces dust. Contains 1.1 oz. 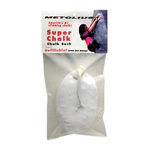 (31 g) of Super Chalk.